How we met- Match.com, I actually thought I was replying to someone else. And I didn't look at his pic until after a few messages! First date- Drinkies at local bar, so easy to chat too then he ran away (literally) at the end of the evening. I was really paranoid as I thought it had gone well. By the time I'd driven home he messaged saying sorry for having to run away as he was going to miss the last train home. 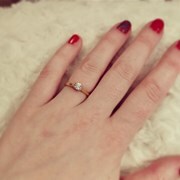 The Proposal- Last Saturday was the 3rd anniversary of our first date. He had organised a day out but it was a surprise. The Monday before my beloved Grandad passed away. Whilst we'd talked about 'our wedding' I was not expecting it to happen. The day before he told me I had to wear clothes that could get dirty, never a good sign!! On the way to the surprise I received messages from my family sharing stories about my Grandad trying not to be too emotional I was quiet, and he kept asking If I was OK. We arrived and we we're going on Segways! Something we'd talked about doing but not got around too. I was so nervous I got picked out to be guinea pig (or so I thought). So off we trundle and travel around some courses, trying to stay on the Segway. Then he stops turns around and drives toward me, I start panicking that he's going to crash into me. He then pulled out a ring box!! I was so shocked, I was shaking like a leaf and crying. He thought I was going to fall off! At this point a guy flew over our heads on a zip wire shouting wahey. Made us both laugh. Not traditional way, but definitely his way. Now to plan a wedding! Welcome to the forum! Always good to have a new thread! We probably looked at about 10 venues online but only went to visit 3 in person. Not really sure regarding kids meals but I would have thought it means that the food is the same price but you just don't pay for a drinks package for them? Do you definately want to get married in a hotel? There are lots of venues with no corkage and where you can bring your own caterers in which makes it cheaper? Hi Kitty, not necessarily we were just thinking it would be easier for us as our guests. BIG exciting news over the weekend!! 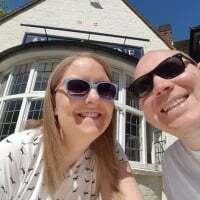 We visited a venue last week which we LOVED, unfortunately it's a bit pricey so we've decided to switch the wedding until next October rather than the summer as it's quite a bit cheaper. It's the only venue we've visited so we are going to look at a couple later this week just to make sure. 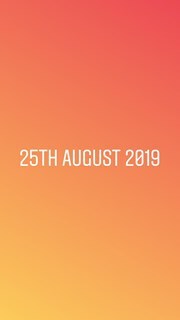 And today we've put a hold on 12th October 2019!!! Just need M&D to view it as they're contributing then we're going to book it!! It's also 10 days after my birthday. So it's going to be Surrey Vineyard Wedding in October 2019!! Now to switch all my summer ideas to autumn ones! Congratulation on your engagement, If the venues are offering price per head for packages offering say canapés, 3 course meal, 1/2 bottle of wine and drinks for toasting, I would definitely raise with them that you have a lot of teenagers who although eat an adults portion, don't drink, Hopefully they will be accommodating. Visited the second venue on our short list yesterday, and it made us love the first one even more! It was a hotel just outside Guildford, generic, noisey and more expensive than the one we loved. 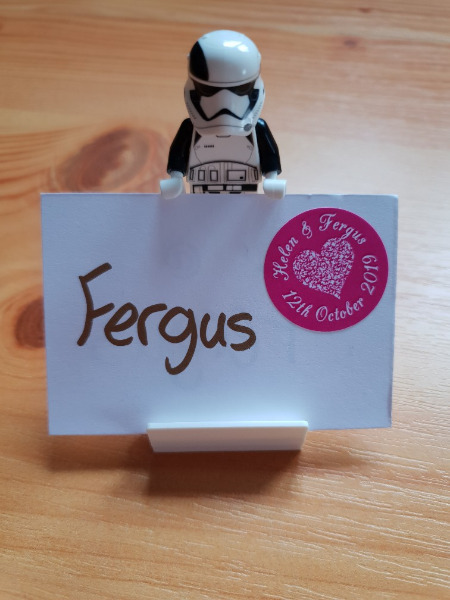 This weekend has been a big weekend of wedding planning as Mum has been up. As mentioned above we visited Denbies Wine Estate days after we got engaged and really loved it. We looked at the Hogs Back Hotel, and Guildford Holiday Inn, but neither can close in terms for look, feel and price. Yesterday took our Mum's around Denbies and they both loved it so we booked it!! I'm not fussed by chair covers or the price but FMIL really wants them so has offered to buy them!! We also tried the wine, and loved the white, as neither of us are wine drinkers we didn't think we'd like any of them. As we had our heart set on Denbies we were happy to book it even though we didn't have a church booked. We stopped by the local church after lunch and managed to meet the Priest. He was happy to book the church there and then, and agreed my Fiancé's Priest could do the ceremony. As Mum was up we went to David's Bridal today to try on different styles as I had no preconceived idea of 'The Dress'. But I tried on a long one, then a short one, a couple more long ones before trying on a really cute short ballerina style dress. My mind was made up....short it is!! I never really wear long dresses anyhow. Right now I don't think either of the short ones are the one, but happy I've got my style. We're still on the fence for theme but we know we want lots of candles all around. The venue want them in jars which luckily I love anyhow. So popped into Poundworld and got 40 candles for £15!!! Been a busy coupe of weeks. We attended our friends wedding in the Isle of Man and whilst on the ferry over I had a phone call saying I'd sold my flat!!! So we're now house hunting and wedding planning together. We have booked our photographer Emma Russell she was the first one we spoke to and she was just so calm. We spoke to a few other but she really felt like the right fit. We have also booked out photobooth we saw it at a wedding fair a few weeks ago. It's an open booth with a flower backdrop. I'm very excited about both of these, I just can't decide which flower backdrop to have. But I'm also really disappointed with our venue decoration. When we've visited they've had drapes up in one of the rooms and seen photos of fairy lights on the conservatory roof. I enquired with the supplier the cost of them....The lights £1200 (there are a lot, but still crazy!!) The drapes (you had to reply saying what you wanted) on paper looked about £600 Ok I could live with that. Quote came back £200 installation and travel AND £200 vat and one wasn't listed in their brochure so.....£1200 for those too!! No way I can justify paying that. When we're only paying 9k for 140 guests 3 course meal drinks canapes and 170 people evening food. Now l'm worried the room will look dull and bare.....Any suggestions? Do you have to use certain suppliers from the venue? if not maybe you can get some more quotes for the lights and drapes? There was a bride on here who bought single strings of lights which were battery operated and she was hoping to recreate a look she had seen that was expensive herself? We don't have to use specific suppliers so I'm now looking elsewhere. A DJ we spoke to suggested lights instead of drapes so we're looking into that. Unfortunately the conservatory lights can only be supplied by one company, so we're having a load of candles instead. This was initially hard to select. My favorite colour is dark purple, and my Fiance's is Teal. But 2 of my best friends get married 18 months ago and both had purple!! I'm a girlie girl at heart so decided on pink. But as the wedding is in October and I didn't want pastels so we're having Navy, hot pink, and gold and white accents. No one could understand my vision until I found some wrapping paper in Clintons, they all get it now......possibly because I have given everyone a square of the wrap! 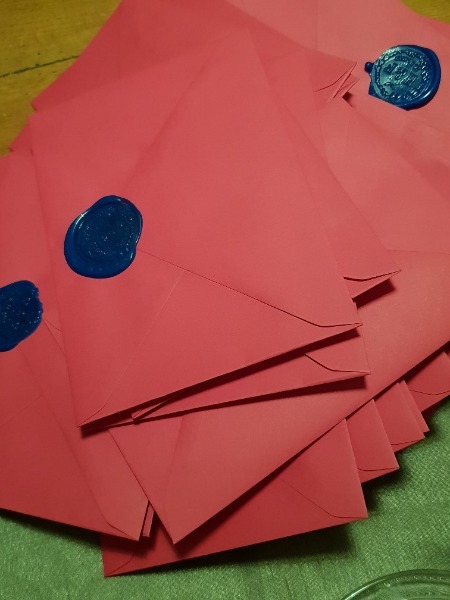 My FMIL really wanted to have chair covers, we were not bothered and saw it as an unnecessary expense, but she was adamant so has decided to pay for them. So we meet the supplier on Friday and we're having loose covers, with alternative Navy and Hot Pink satin sashes. We are also having matching navy swagging on the top table. The same supplier is also draping the garden room, including fairy lights and pink uplighters. My Mum is really keen on some wedding DIY so she is also decorating 70odd jars with lace, ribbon, bows, buttons etc for candles to be in. We're hoping the weather will be good enough for some to be placed in the courtyard for the evening reception. 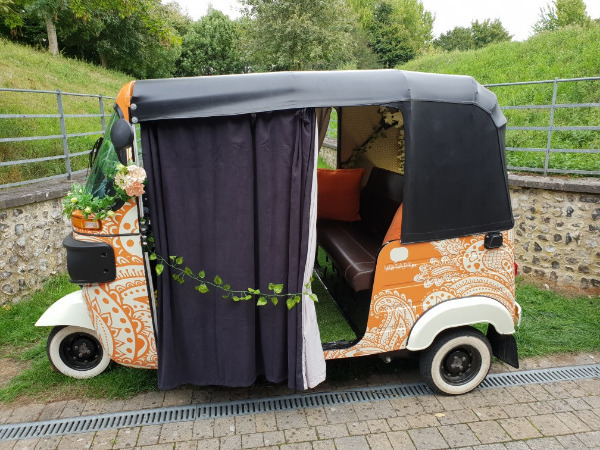 The day after he proposed, I brought a Wedding Magazine and read to my fiance that you could have a wedding TukTuk. Having traveled a lot he was instantly in love with this idea. Luckily there is an operator near us. So yesterday we went to see the TukTuk, and he loved it even more in person, we booked it there and then!! They just have to check the route is suitable before they can confirm so fingers crossed. It will also be taking us back to the reception venue. All of the centrepieces I looked at online and liked seemed to cost ALOT!! I loved blossom trees but at £60+ each for 14 tables, was just not sensible. But I saw online various bottles with candles and flowers in. I've spoken to the florist and they are happy to provide the flowers and set them up. So we're having gold bottles in various sizes, some with candles some with flowers, surrounded by rose petals and pink tea light holders and candles. 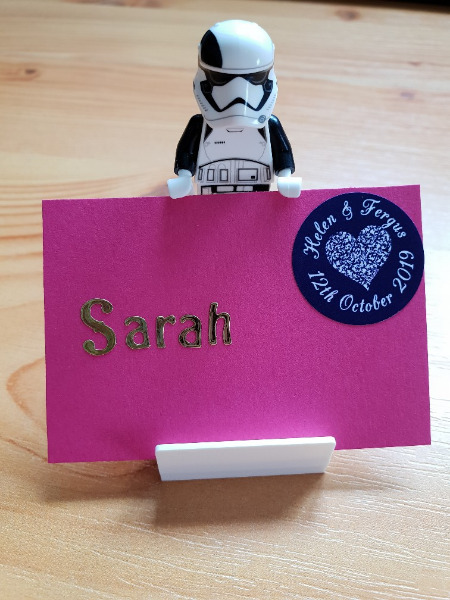 My fiance is a HUGE star wars fan, and I wanted to make sure we included his interests in the day. 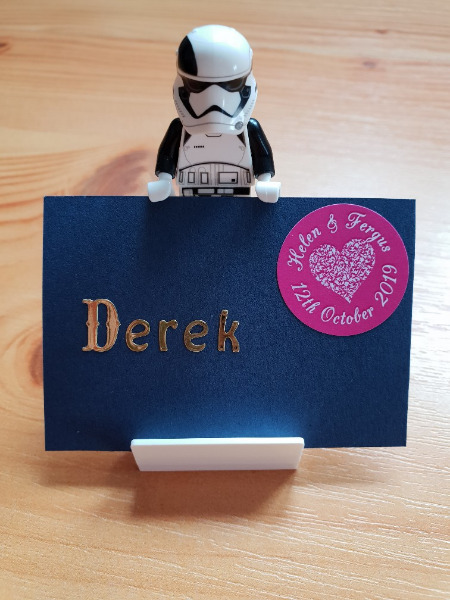 I saw on pintrest some holders for namecards that were stormtroopers, there were no instructions so today I have made some prototypes. These will not be cheap but I'm hoping any that are left we will be able to resell as a kit and make some money back.......I think the design needs a little tweaking, and hopefully we can find someone in the family who's writing is better than mine, or we'll go with the letter stickers. I make cakes for a paying hobby, my sister also makes cakes and one of my oldest friends is a michelin starred pasty chef. So a single cake isn't going to work for me. So we're having a 3 tier navy cake with gold leaf and large pink blooms, surrounded with cupcakes, Cookies, brownies, meringues, macaroons, marshmallows and probably more. I'm very excited about this and it's something MrMc gets no say in!! We are also doing gold bottles and jars filled with flowers and candles - we have long tables so they will be along the centre on a navy lace table runner. Our colour scheme is navy, gold, coral, peach and a tiny bit of mint I have boxes and boxes of bottles and jars in my shed waiting to be sprayed! Haha!! we're moving soon so we haven't got any jars or bottles yet......all the family are collecting them for us though. 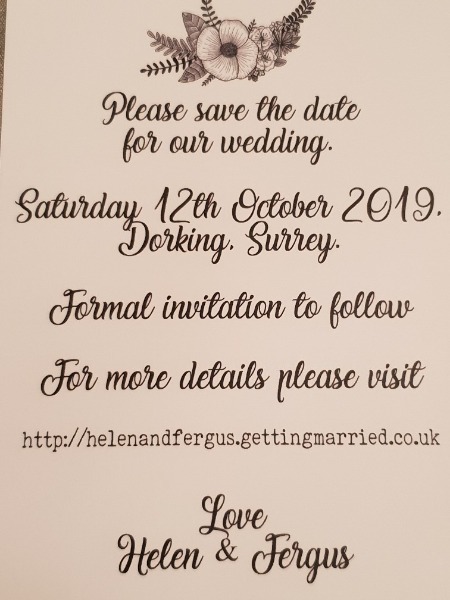 I'm really pleased our Save the Dates are ready to go!! 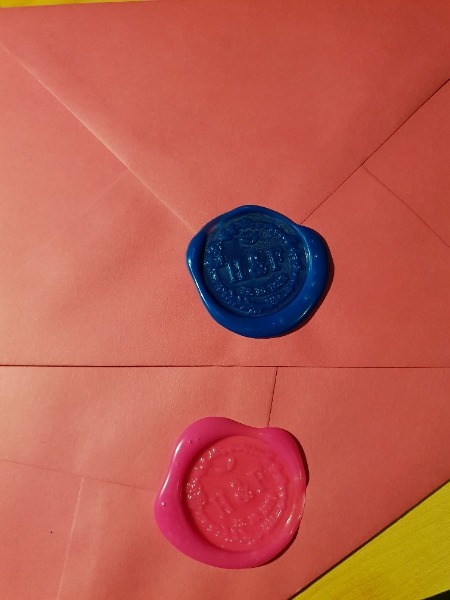 As our colour scheme is Navy and pink we decided to get some hot pink envelopes and tried my hand at the wax seals. I was pretty impressed with how they came out once I got the hang of how much was was needed. Booking the DJ was something that was really stressing me out. When we visited our venue the first time we met one of their recommend DJs. 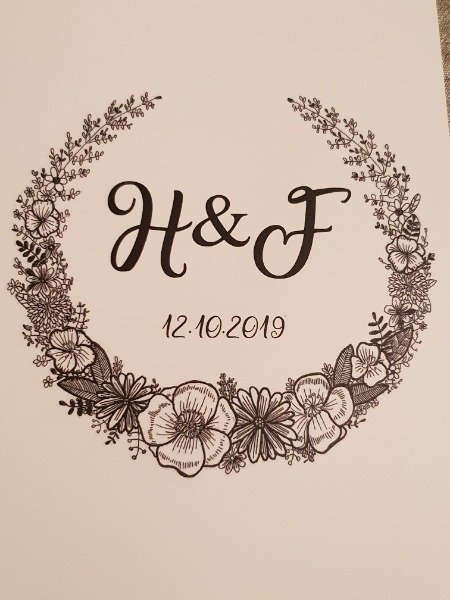 Music is really H2Bs thing but having been to a friend's wedding where the DJ didn't really get the guests into the party mode this was one thing I wanted to get right! He seemed ok so we asked him to give us a quote.....that took WEEKS! Then I asked a question the response took weeks again. Then he decided it was best to call me to discuss it. On the phone call it was like I never spoken to him or discussed anything by email. He said again he'd send us out the price list to answer all my questions......it never arrived. I decided not to bother chasing him, by now I'd decided he definitely wasn't for us! So I contacted the other recommend suppliers....Only one got back to me out of 3!!!! And the one that did sent their price and when I asked a question they never replied. So I sent out numerous enquires through Bridebook a couple replied but the swing in prices just made me totally confused they were between £500 And £1500!! One phoned me to discuss, who had great reviews, but he talked at me on the phone for an hour whilst he was driving. Would only send me the price if I messaged him again. We'd only be able to meet the DJ beforehand if we booked the top package (£1300!!) AND mocked some of our ideas and almost had a go when I said I wasn't booking something at the venue because of the price, surely that's my choice?! So I started scouring the internet for another DJ. I came across Brian Mole, who'd recently won a Wedding DJ of the Year award for the South East. His reviews were fabulous! Whilst there were no prices on his website I thought he was worth a shot. I cannot fault his service! He offered to come out and visit us at our house, considering were 40 mins from the venue and he's beyond that we were amazed! I was expecting a huge price tag! He came along (arrived early, which actually pleased me, I'm one of those if you're on time you're late people!) with a great book, not leaflet full on bound book with song suggestions, tips for wedding planning all sorts. He was lovely asked about our music tastes, concerns, etc. I was still waiting nervously for the price.....but knew we really liked him. Luckily he came in on budget!! And he has a unique white campervan DJ booth we're getting for free as it's not been to our venue before. So last night I had a nightmare centered around the cake. (My vision is Navy blue cake a couple of hot pink flowers and some gold trim. 4 tiers.) We'd had the drinks reception and were invited to look at the Wedding breakfast room, it's a giant conservatory. The room wasn't set up, there were huge square tables and long ones. No top table. Not enough tables and a huge black box taking up a massive part of the room. The I realised there was no cake!! Around where the cake should have been were meant to be mini cakes, brownies cookies etc and there were about 20. (We're having 170 in the evening) I was told the cake was going to be there shortly as the baker had changed the delivery time. Then I saw the sweet table there were no jars and a few sweets were just dumped on the table. FH was no where to be seen. I went outside crying without my shoes. When I came back in the cake had arrived but was a naked cake with rainbow sponge. There were more tables but not enough. FH appeared ate this point, whilst I was searching for the gold cake stands for the meagre amounts of mini cakes. He'd been playing football in the ground with his friends. We were then going to be announced and I realised I didn't have my shoes still. Running around every where for them and couldn't find them. I was told they'd been stolen. 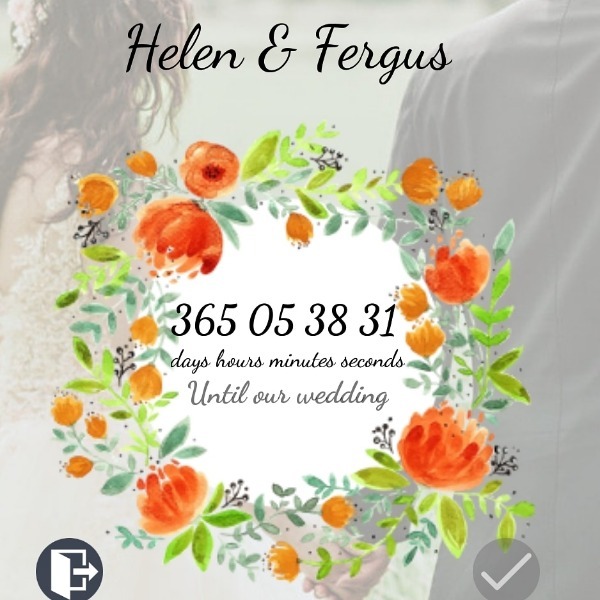 1 year today until our wedding!!! Of to the National Wedding show tomorrow with MOH, MOB, MOG and bridesmaid. Quite excited. 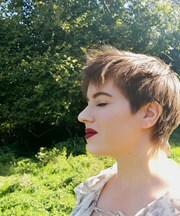 I keep having wedding dreams too, the other day it was that the MUA didn't show up! Aww bless you having wedding dreams this far out! im sure there will be no cake dramas on the big day! Visited the National Wedding show today with the girls. It was fun, but all the dresses were quite overwhelming and caused a minor internal freak out.... leaving me more convinced I won't find a dress. Although I feel this is also partly due to the stone and half I've put on over the last year. I found that I didn't like any dresses I saw at the big wedding shows but but then found some lovely ones when I went to try on. I'd go visit some shops and see how you feel! Ahhhhhhh it's finally moving day tomorrow, and it was only confirmed yesterday!!! This house move has stressed me out to the absolute max. Many times I've felt like crying or screaming if the last few weeks of wedding planning go like this I'm going to be a mess for the wedding. And knowing I've not done anything wedding for 6 weeks is also worrying me. Still Sunday morning we'll both be in our first house with all our stuff (I move tomorrow, he moves Saturday) and that i cannot wait for! !